Last month was the third veganuary I have taken part in and to be honest, it was my worst attempt...in my defence, I couldn't prepare fully beforehand and my diet is 90% vegan already but enough of making excuses! Today's post is going to be a review of some of my favourite products from last month that are crueltry free or suitable for vegans. For the past three or so years Antipodes have been my favourite skincare brand! I've been using their products almost consistently for a while, through amazing skin days to horrendous fortnight long eczema flare-ups and I cannot recommend their products enough, especially if you have dry and sensitive skin as I do - they are heaven sent products! For the majority of December and January I've been using their vanilla day cream which I adore but recently I've been trying their Immortal SPF 15 moisturiser which is perfect for this time of the year when my skin still needs nourishment and moisture (it's still snowing here as I'm typing this) but we are having lighter, sunny days so the SPF 15 is definitely needed. Unlike other Antipodes moisturisers, this one barely has a scent and it's very lightweight but it's still great for my dry, sensitive skin. I know I'll get so much use out of this moisturiser in the upcoming spring months. I've tried so many of their serums, moisturisers and a couple of cleansers but this is the first exfoliator from Antipodes that I've tried and I love it! 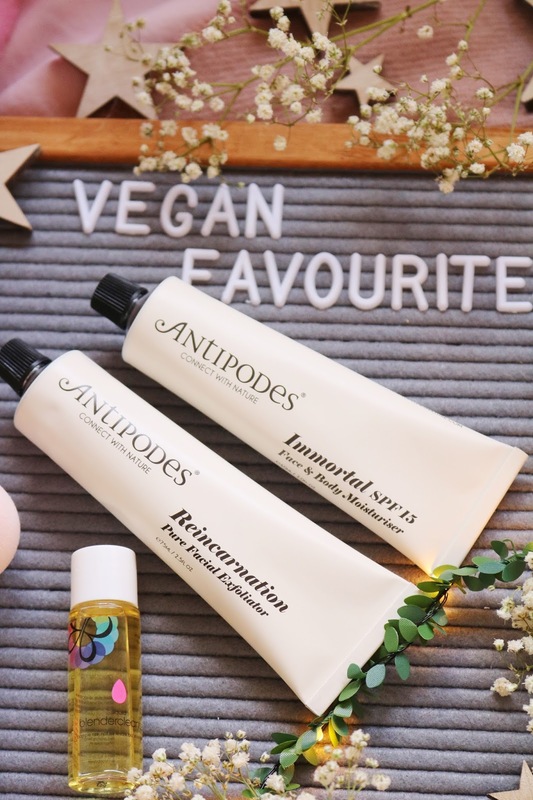 It contains wonderful ingredients as every Antipodes product does and both of these mentioned are suitable for vegans. The exfoliator is so gentle but very effective, it's one of the best exfoliators I've ever used as it leaves my skin so incredibly smooth, soft and clean without it feeling uncomfortable or harsh. I cannot recommend Antipodes as a brand enough, especially these two products which I've been loving recently. Last week I received an amazing package from no other than Beauty Blender UK as they are celebrating 15 years of perfectly blended foundation! I have had so many Beauty Blender dupes as well as the original pink Beauty Blender and none of the dupes compare to the original, in my opinion. The original is fluffy cloud compared to the other dupes as it's so incredibly soft, squishy and when damp, it's the most ideal tool to apply foundation over my dry, sometimes flaky skin. Brushes tend to emphasise the dryness of my skin when applying foundation or concealer so the best option is a damp, soft Beauty Blender as it applies and blends my foundation and concealer perfectly providing a seamless finish, blended to perfection foundation and it's amazing for my dry skin. If you also have dry skin and find that brushes just emphasise the dryness then check out the original Beauty Blender. I have searched online and I think that they are cruelty free and suitable for vegans to use, let me know if this isn't correct! Last year I was very kindly sent the Perricone MD No Foundation Foundation and I adored it but it was a little too dark for my ghostly pale skin but thankfully they've just released a lighter shade. I have the lightest shade available (Fair, F) which is the most ideal match for my skin! I love the packaging, it contains SPF 30 which is amazing and for me it provides a radiant, skin-like finish, light coverage and it helps to even out my skin tone. On New Years eve I finished up the last of my all time favourite foundation and I've been using all of my disappointing foundations since then which obviously results in awful looking skin but since I received this foundation, it's been the only foundation I've used and now I've had nothing but amazing foundation days! It makes my skin look radiant, even and provides the coverage I want on a daily basis, it doesn't irritate my skin and it claims to visibly improve the skin's appearance over time. As well as the foundation which I absolutely adore, I also received their new concealer (thank you!) which doesn't seem to be on the website yet but you can sign up to receive a notification when it is in the link above. 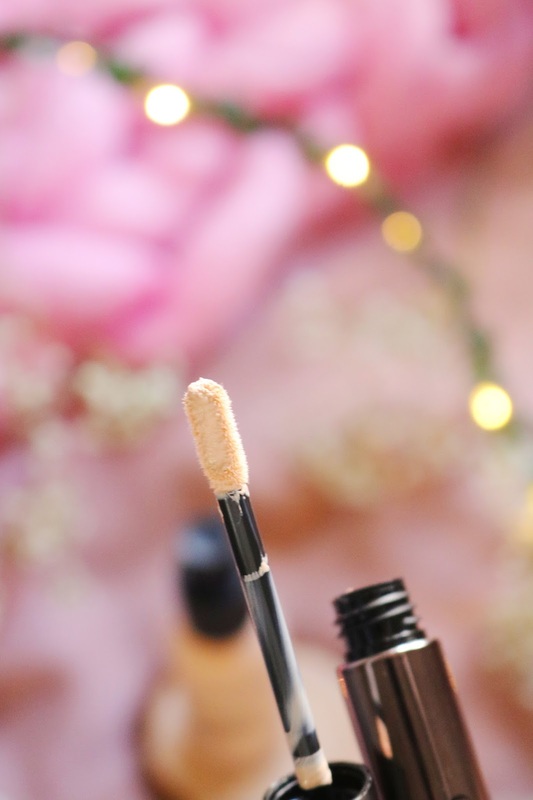 I love the packaging for the concealer, the shade is another perfect match and it claims to provide instant coverage for imperfections, dark circles and discolouration. As well as the foundation, the concealer has amazing SPF which is ideal for the upcoming sunny spring days. The coverage is fantastic (it's medium to buildable coverage) and as I have the lightest shade it adds so much brightness under the eyes which is definitely needed as my dark circles are stubbornly intense. 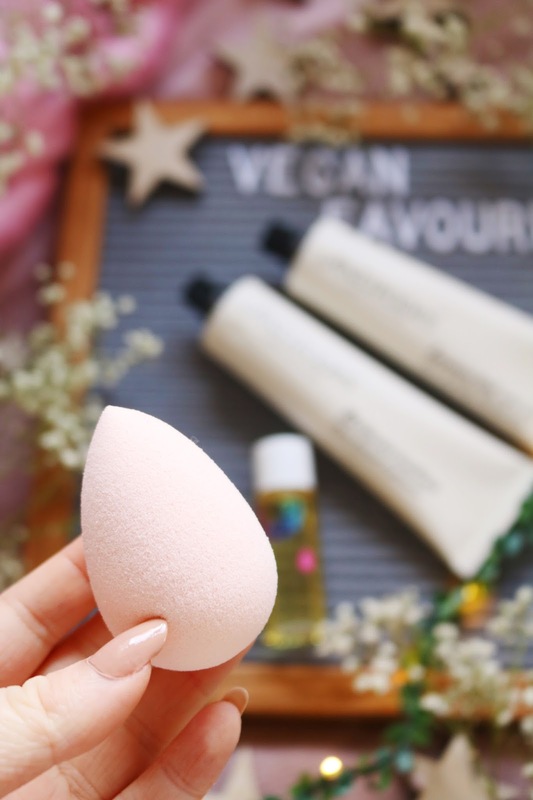 I apply the foundation and concealer with my Beauty Blender and it's the most effective trio for my dry skin during the still chilly winter days. Last but not least is a food favourite! Baconlicious very kindly sent me a tonne of samples of their products all the way from sunny Australia. Their products are suitable for vegetarians and some are suitable for vegans, either way, they are all delicious. The main product I've been using is the Maple Glazed Bacon Seasoning which is suitable for vegans! To me it tastes like bacon flavoured crisps and it's gorgeous within creamy smoky vegan sauces and dips or just sprinkled onto vegan pizza and salads. A little goes a long way so it will last a while and there are so many uses for the seasonings. They also make BBQ glazes and spray on seasonings, I have a few of them and I also love the garlic spray on seasoning. All of the products I've tried so far have been incredible, it's hard to believe that they are vegan as they taste amazing, smoky and moreish. Even though they are based in Australia, they offer world-wide shipping so definitely check them out. I will have a couple of recipes using these products on my blog over the next couple of weeks. Have you tried any of these products? What do you think of the Baconlicious Bacon-Free Seasonings? We're biased, of course lol, but they are a sensational way to add that bacony flavour to anything at all, while being 100% bacon free and fully Vegan safe. Absolutely love Antipodes products, my faves! 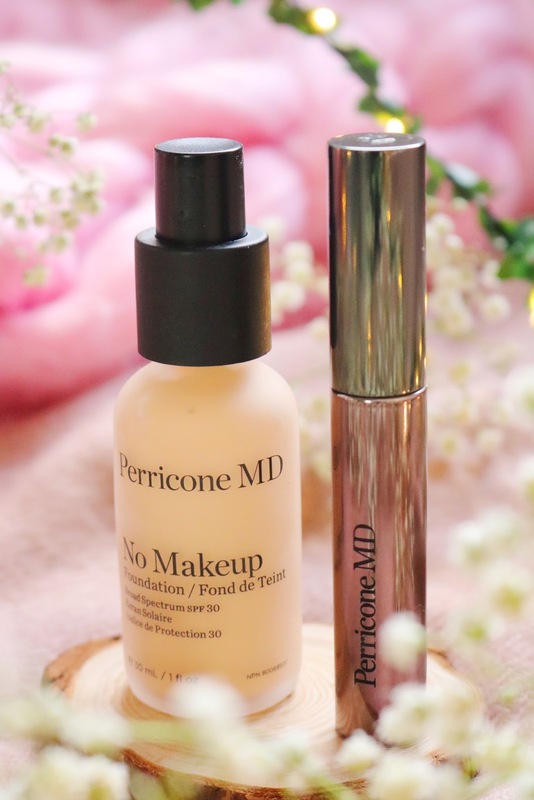 I’ve always been interested to try the Perricone no foubdation foundation! It’s on my wish list! I've heard great things about Antipodes really want to try a few from them. I absolutely love everything from Antipodes that I've tried, I think I'm due some repurchases soon! Nothing beats a fresh new beauty blender! They sound lovely, I’d love to try out Antipodes products. We're wrapped that you are enjoying our products and we're really looking forward to your upcoming creations.